Dry roasted fenugreek seeds powder - 1/4 tsp. Turmeric powder - 1/4 + 1/4 tsp. Sambar powder - 1 tsp. Wash and chop bittergourd into thin 1" lengthy pieces. Discard the seeds. Add salt and 1/4 tsp. turmeric powder, mix well and marinate for half an hour. Squeeze well and discard the squeezed water. Doing like this prevents thokku becoming bitter. Soak tamarind in warm water and extract juice. Heat oil in a kadai and deep fry squeezed bittergourd in batches until they become golden brown. Keep aside. Heat oil in heavy bottomed kadai, add mustard seeds, asafoetida, turmeric powder and curry leaves. 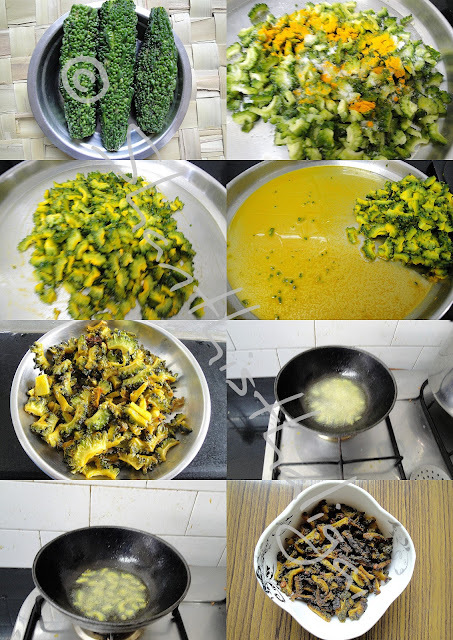 Add the deep fried bittergourds, chilli powder, sambar powder, little salt and tamarind extract. (Be careful in adding salt as the bittergourds are already marinated with salt). 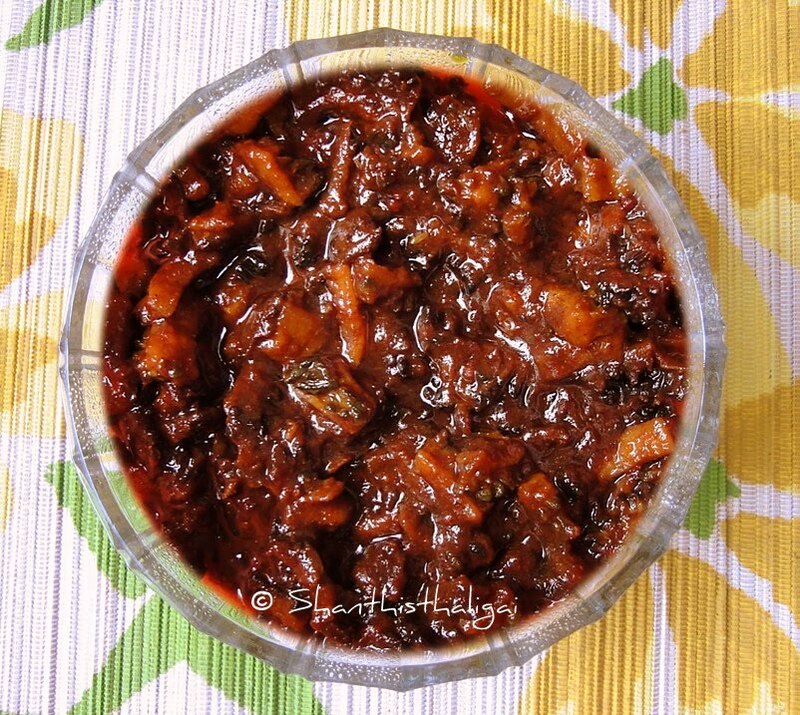 Cook on medium flame until it is thick, Now add jaggery powder, mix well and cook for a while. When it becomes saucy, and oil leaves the sides, add roasted fenugreek seeds powder, mix well and immediately switch off the stove. When cool, store in an airtight bottle. This goes well with curd rice and even with chappathis and pooris. It can also be mixed with cooked rice. This stays fresh for more than 2 to 3 months. Superb recipe! Thank you! Could bitter gourd be replaced by some other vegetable?